The Big Bang UK Scientists and Engineers Fair, from 16th to 19th March at the NEC, Birmingham, will combine theatre shows, interactive workshops, exhibits and careers information for students studying Science, Technology, Engineering and Maths (STEM). The Fair is targeted at students in Key Stage 2 through to post-16 and will highlight how classroom learning can be used in real life through a range of engaging activities. The four-day free event will feature over 150 interactive stands and workshops including ‘It’s only water! Or is it?’, ‘The Science of Everyday Life’, ‘Can you Believe your Brain?’ and ‘The Most Mathematically Marvellous Show Ever’. 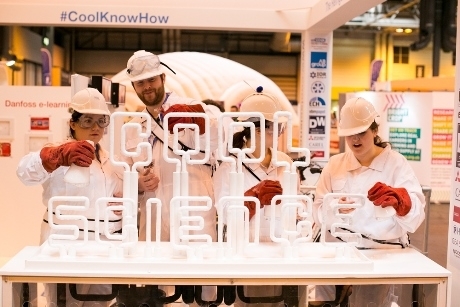 The headline shows, ‘Gastronaut and the Quantum Mechanical Chocolate Factory’ and ‘The Hollywood Special Effects Show’ will explore Chemistry, Engineering, Biology, Mathematics and Physics for all ages and will be held on the Big Bang Stage. A current list of shows and workshops is available at www.thebigbangfair.co.uk/plan-your-visit/shows-and-workshops. For students considering their options for after leaving school and the possibility of a career in science or technology, STEM professionals will be on hand to provide information and guidance in the Careers Cabin, whilst the hands-on activities will offer a chance to try out real-life work in the subjects. A careers networking activity called ‘Meet the Future You’ will also be held in the Careers Cabin allowing students to find out more about what different jobs in science and engineering involve. The event was first held in 2009 with 6,500 visitors and has now expanded to almost 70,000 in 2015. Although The Big Bang Fair is free to attend, it is necessary to register beforehand. For more information contact info@thebigbangfair.co.uk or visit www.thebigbangfair.co.uk.